American colleges and universities have seen massive growth in international student enrollment over the past 11 years. The presence of these overseas scholars in both undergraduate and graduate programs has nearly doubled, to over one million students by the 2015–16 academic year. According to a study conducted by NAFSA: Association of International Educators using U.S. Department of Education and Commerce data, those 1,043,839 foreign students contribute $32.8 billion and 400,812 jobs to the U.S. economy. For every seven international students, a new job is created, and each student generates $31,422 in revenue. International students come to the United States from around the world, and most are paying full tuition. They are bright and studious. They believe that the education they are receiving is of excellent quality and that when they graduate they will be offered great job opportunities. Most citizens of the Middle East believe American higher education is the best in the world, and they are proud that they, their siblings, and their children have American degrees. However, the days of increased enrollment of international students, especially those from the Middle East, may be quickly coming to an end. Six U.S. higher education associations recently commissioned a survey (“International Applicants for Fall 2017—Institutional & Applicant Perceptions”) to determine whether the 2016 presidential campaign and its anti-foreign tone would have a chilling effect on international student recruitment. The initial findings were published in early March. 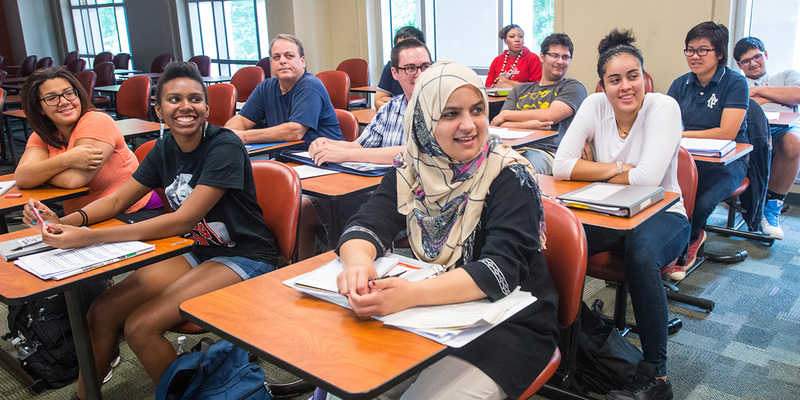 Nearly 40 percent of the more than 250 institutions that participated in the survey reported a decline in international student applications from the Arab world. The respondents reported that the decline is occurring due to concern on the part of students and families that student visas will be more difficult to obtain, and that the United States is no longer as welcoming to international students. 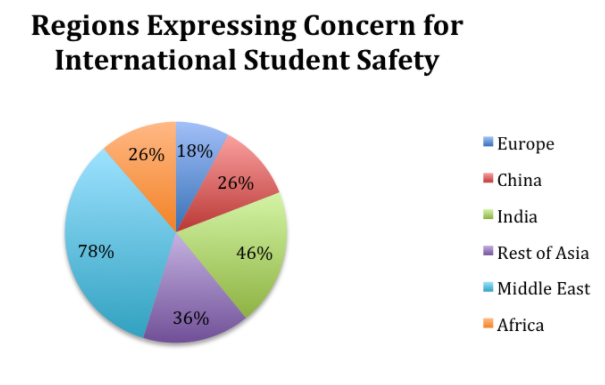 There is also an increased concern for international student safety (see chart below). During a conference in Dubai just after the U.S. presidential election, I spoke with some regional government officials and U.S. scholarship funders about the election and its implications. I was told that plans were moving forward to discontinue sending students to the United States. Officials and funders were looking elsewhere, with China being considered as a prime location due to growing business ties and program quality. They still love U.S. colleges and universities, people told me, but they believe that the communities that surround their campuses have become too hostile. Caitlin Dickerson and Stephanie Saul of the New York Times, wrote in the article Campuses Confront Hostile Acts Against Minorities after Donald Trump’s Election about recent instances of harassment of Middle Eastern students in Tennessee and California. And there have been other disturbing reports. A Saudi student attending the University of Wisconsin–Stout was killed last October. During the past year, Saudi and Kuwaiti students at Idaho State University have had their cars vandalized and apartments burgled. Notes were left on the vehicles demanding they leave the country. An Emirati graduate student attending Case Western Reserve University in Ohio was killed on December 4 in a scuffle with a police officer after a traffic-related incident. As of December 13 of last year, the case has been ruled a homicide and is under investigation. While these events may be isolated and the schools are trying to reassure Middle Eastern students that they are welcome and safe, parents, students, and their fellow countrymen are not so convinced. The economic impact on the United States of losing the Middle East student population would be $3.4 billion dollars and 15,000 jobs. This could lead to an increase of American university closures and mergers. Many institutions count on healthy international student enrollments to keep themselves on a strong financial footing and their courses, especially in the STEM fields that such students often seek, fully subscribed. American colleges and universities need to revisit and update their international strategic plans. Institutional audits are needed, and would give the senior university officials a better grasp of the current situation, help them develop benchmark data, and support the creation of a plan that involves all campus stakeholders, including international students. Universities in the United States also need to reinforce the concept to their community at large that Middle Eastern students mean more than just revenue. Their presence gives American students and the community they live in the opportunity to learn more about other cultures beyond what they see on TV and social media. They enhance networking opportunities. Students gain additional insight into how the world and business work in other nations, which one day may mean finding a new business opportunity. They enhance American students’ ability to find employment with firms who desire people with a broader international view. Perhaps the most compelling reason is that a campus community that reflects the world simply opens up a person’s eyes to the world of possibilities. Many institutions say one of their goals is to provide a global view to their students, and that international students are important to them. However, few presidents or provosts have a clear plan to expand international enrollment or to prevent losses. How much do they know about support and buy-in from faculty, staff, and trustees? Do they currently know how much support there is for international students from their local government officials and business leaders? If the university leadership does not clearly understand, how can they develop a credible plan to move forward? Higher education institutions must take the magnitude of the coming crisis seriously by conducting an evaluation of their institution for its strengths and weaknesses, making proper preparations and then aggressively moving forward. Dean Hoke is cofounder of Edu Alliance Ltd., a higher-education consulting firm with offices in Bloomington, Indiana, and Abu Dhabi, United Arab Emirates.